In an effective 30-minute stay interview, managers ask standard, structured questions in a casual and conversational manner. It’s not a performance discussion but rather a “let me get to know you and your goals” discussion. 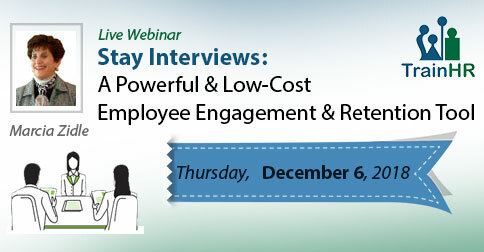 Why should you Attend: A recent Harvard Business Review article ‘How to Keep Your Top Talent’ warns that 25% of your top talent plans to jump ship in the next year.The results for engagement and effort are even more alarming, since about a third of employees surveyed admit to phoning it in at work. That’s bad news if you believe that staying competitive relies on the passion, drive and creative energy of talented people.